"While Waylon was recording, I went back on the road. In 1966, producer Crash Stewart and I put together a Texas tour that included Hank Cochran, Johnny Bush, and my own band. By then Paul English had moved to my farm and become my permanent drummer ----- wild, street smart Paul who always had my back and got me out of more scrapes than I can recall. Crash wanted to add a new artist to the bill: Charley Pride. "He's not only a good country singer," said Crash. "He's a novelty." That worried me only because the tour was going into deep South Texas and roughneck Louisiana. I envisioned riots. "Before you decide," said Crash, "listen to his single." I listened and liked it. It was a song called "The Snakes Crawl at Night." Charley had a singing style all his own. "Book him," I told Crash. "Paul and I will deal with the consequences." Charley turned out to be a great guy ---- smart, congenial, and humble. Some country fans were taken aback when they saw a black man singing in my show, but the moment he opened his mouth they shut theirs. They heard that Charley could sing. Then came the night I was off work and went to hear Johnny Bush at the Longhorn Ballroom in Dallas. That big barn of a nightclub was owned by Dewey Groom, who had a strict segregation policy when it came to artists and their audiences. To use Dewey's unfortunate expression, he'd call Tuesday night "n**ger night." That meant B.B. King or Bobby Blue Bland or Jimmy Reed was headlining and the crowd would be all black. Country music nights, like the one with Johnny Bush, were all white. This particular night I got silly drunk and decided to take the stage. My buddy Johnny didn't mind. "What are you gonna sing for us, Willie?" asked Johnny. "I'm not going to sing a lick," I said, "but I am gonna ask a friend of mine to come up here and entertain you." I had Paul go get Charley, who was waiting outside, and bring him to the stage. I could hear all sorts of groans and moans and nasty catcalls. The loudest protest came from Dewey himself. But I just held up my hand and said, "Wait 'till you hear him." And then, surprising even myself, I kissed Charley Pride full on his mouth. Then Charley breaking into his beautiful "The Snakes Crawl at Night." And, when he was through, thunderous applause. "You see," I said to Dewey. "God didn't strike no one dead. The world is still turning. Along with everybody else, you just fell in love with Charley Pride." Dewey was a good sport. He came back to the motel with all of us, where we had an all night jam session. Everyone got plastered. When morning came, I looked over and saw that Dewey and Charley had both passed out on the same bed. Due to my own inebriation, I lacked the presence of mind to snap a photo. But I did manage a smile and offered up a prayer. I thanked the Lord for strange bedfellows." ------ Willie Nelson, "It's a Long Story: My Life." I can't recommend the book enough for fans of Willie, Texas, country music, or fun. [+3] - edgarblythe - 07/23/2017It's not really about country music. I spent some fraction of my early life hating country music. I got over it. I know that was a stupid bias. It's still no where near my favorite. It's not really about country music. Thanks for sharing that story. I'd like to read that book. He was an amazing singer, writer and part of music and American culture's long varied history. The lead post discusses black performers in southern venues. 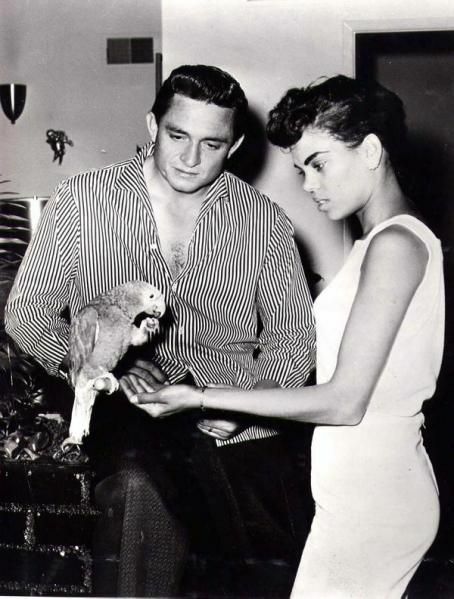 Here is a photo of Johnny Cash's first wife.